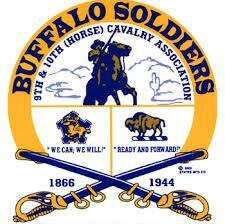 The Alexander/Madison Chapter of Kansas City Area Buffalo Soldiers 9th and 10th (Horse) Cavalry Association is riding into Liberty, Missouri for a special event! For two days, May 11th and 12th, 2017, the original and oldest chapter of Buffalo Soldiers in the nation will inform and entertain with true stories of the nation’s first African-American troops to serve in the regular peacetime army. They were first enlisted in 1866 and served until 1944. Thousands of men and even a woman served our nation going from slave to soldier, with untold honor. Because of the two days at the Mid-Continent Library in Liberty, Missouri allows for a complete telling of the Buffalo Soldiers story this year! It will be performed in two parts, from slavery through the end of the Civil War on the first day, and from 1866 until the end of the Indian Wars and beyond. This “don’t miss” engagement is brought to you by the Mid-Continent Public Library located at 1000 Kent in Liberty. Both days the program starts at 3:00 pm and will be followed with time to meet the Buffalo Soldiers and ask questions. Come yourself and bring the young ones as you take a trip back to the open western frontier, full of mystery and adventure. Fun for all! Experience and enjoy an hour of American history that will make you proud. Come and find out what Jackie Robinson and Abner Doubleday had in common (not just baseball). Find out how a woman served some of the roughest duty assignments in the western frontier for nearly two years without being discovered. Witness the complete telling of the Buffalo Soldiers this year! This oral history excursion will be performed in full costume both days. The troopers involved have been in plays and even movies! This rare opportunity is free and open to the public. We hope to see you at 3:00 pm, this Thursday, and Friday, May 11th and 12th at the Mid-Continent Public Library located at 1000 Kent, Library, Missouri.